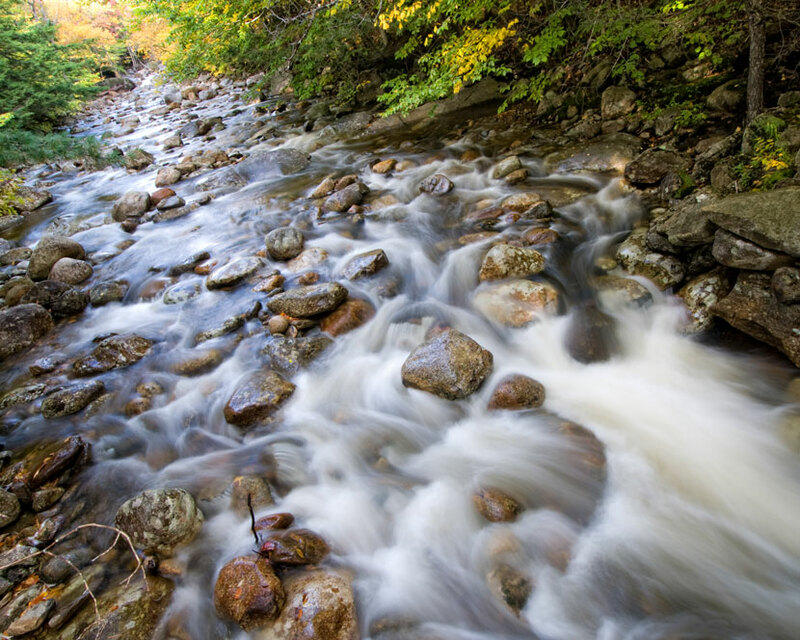 Slippery Brook Trail in Chatham, NH by Ken MacGray. A collection of photographs by Ken MacGray are on display at the Forest Society's Conservation Center in Concord until the end of February 2019. The exhibit is a display of watery-themed photographs shot in various locations around New Hampshire. Along my travels through the forests and woods of New Hampshire, I've always been drawn to water. Its sights and its sounds. The way it moves freely along its course, even in the presence of obstructions. Its destructive nature to reshape entire landscapes and its quiet trickle underground. As much as I'm drawn to the wide open mountain vistas, I am also drawn to the details of the forest, with water being high among them. The mere presence of water along with its soothing sounds is one of the ways I find relaxation away from the stresses of the world. Through these images, I hope to convey the sense of calm I experience being near water while also trying to capture its energy as a source and symbol of renewal. Ken MacGray is a designer, photographer, budding author and hiker based in Concord, NH by way of Central Massachusetts, inspired by the nature and its details. After discovering his father's Kodak Instamatic camera at a young age, he's always been interested in documenting the environment and preserving the memories of what he experiences. He also draw inspiration from urban decay, architecture, landscapes, found typography and interesting people. He's been fortunate to have images recognized and exhibited at locations in New Hampshire and Massachusetts, receiving many awards in the process, and currently use photography to help small businesses in southern New Hampshire reach their existing and potential customers through social media. All of the prints displayed in this exhibition are for sale for $35, including matte and frame, and a portion of sales will benefit the Forest Society's conservation work. Larger sizes are available to order, please contact Ken MacGray for more information. The Conservation Center is open weekdays from 8:30 am. to 4:30 p.m. The exhibit is in the center's main conference room, which is used for meetings, so please call ahead at 224-9945 to plan your visit at a time when no meetings are scheduled. Pond Brook in Sandwich, NH by Ken MacGray.